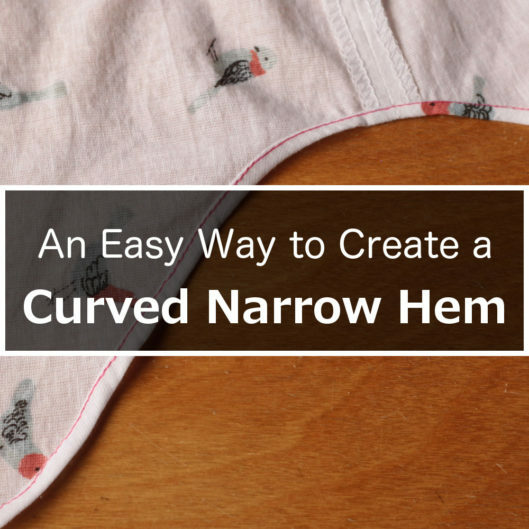 There are many tutorials out there on how to create a narrow hem. The problem is they mostly demonstrate on a rectangular piece of fabric, which makes the process deceivingly easy. With a few exceptions, that usually is not how I use a narrow hem. If I need to hem something straight, a wide hem of 1″ or more (2.5 cm or more) is appropriate. A wide hem creates some weight at the bottom, and that slight extra weight helps the skirt or shirt to hang better. As a result, I still haven’t got a chance to try out the ban roll method. It certainly looks good on paper though. A narrow hem (or a baby hem) is appropriate when you are hemming a circle skirt or a shirt tail. Let’s say this is a circle skirt pattern, by hemming, you are folding the skirt up so that the red line gets to the green line. Even without measuring, you can tell that the red line is longer than the green line. The wider the hem, the bigger the length difference between the red and green lines. There are other methods, such as creating a hem facing, if you really want a wide hem. But that’s besides the point; don’t let me go off on a tangent. My point here is that a narrow hem is the appropriate way to hem curves. Then the red line and the green line would be more similar in length, thus you can just ease the red line a little and fit it into the green line. Use a narrow hemmer foot. The problem of this option is that, even though the result could look amazing, the learning curve is very steep. You’d need to practice a lot to make the result look semi-decent. Use the rolled hem function of your serger. I personally am not a big fan. It reminds me of the super fast and cheap fashion. It could look good in certain applications as a decorative element, but it doesn’t convey quality in a classic shirt. Just wing it. Do a double fold along the curve as you stitch the hem. Unless you have super power, this method likely ends in jagged angles. Stay stitch along the curve, and then fold up along the stay stitch. This method could look OK, but if you want to double fold, the inside would still look like a mess. And finally, this is my method of choice. A serger is required though. But I do have one. I cut a portion of a shirt tail (from my Mila Shirt) for this demonstration. I serge the curved raw edge. At the sewing machine, I fold the beginning of the hem. Note that I only finger press it; I don’t even need to press it with an iron. Single fold along the top of the serge stitches. Than fold again. The serged stitches act as something I can leverage. I set my stitch length slightly longer. The default stitch length of my sewing machine is 2.5 mm, but for this, I set it to 3 mm. In fact, it’s not only this method that you should set your stitch length slightly longer. You know that annoying way the hem flip up after washing? A longer stitch length will help. I am not saying this would definitely prevent the flipping from happening, but it does help. I start stitching on the double-folded hem. I continue to double fold right before the needle hits the portion. As with my method of setting in sleeve, I am only focusing on the next inch (2.5 cm) or so. Don’t try to fold too much ahead of time. When getting to the very curvy portion, I do exactly the same: keep double folding. That’s all there is to it. The hem is likely stretched out a bit right after stitching. So go ahead and give it a good press with lots of steam. Here is the narrow hem from the right side. The narrow hem on the wrong side. Give this a try and let me know how you like it! Ready to make garments with narrow hem? Check out Chirripo Top, Crystal Cove Cami and Giverny Dress. So glad your tutorial came up in my Google search. Did my first narrow curved hem tonight by your method and it’s brilliant. Thank you so much for the information. Whew. Just finished my hem by your instructions #4. It looks great, only one little boo-boo on the inside and not at all noticeable. It was hard, for sure! It was just like yours, a swoopy hem but I’m so big mine was about 500 miles around! Twice! Once for the stay stitching, then for the hem stitch. you are welcome Donna. ? Great idea – I am going to try it on my next shirttail hem! It’s great to know that I’m not the only one who can’t seem to grip the “easiness” of the rolled hem foot! UGH! It looks really easy in the How-to videos. I am absolutely trying this! Thanks for the tutorial? Normal (not messing with the differential) feed? I’ve never tried this method, but I will. Certainly my rolled hem foot and I have never become best friends, LOL! Yes, Angela, I use “normal” differential feed on the serger. I like the look of that! I usually use bias for shirts and serger only folded once for circle skirts. But this looks much better! I recently bought the Mila (and Bonn) patterns just waiting for the kids to go back to school next week. Thanks for sharing!